Received December 19, 2002. Accepted March 14, 2003. Strong evidence of genetic contributions for both disease development and progression is emerging for many renal diseases that are major public health problems and often lead to end-stage renal disease (ESRD) (1). Several genes have been identified for many such progressive nephropathies, i.e., focal segmental glomerulosclerosis (FSGS), nail patella syndrome, as well as Alport syndrome (AS), and their variants (2–5⇓⇓⇓). FSGS (MIM 603278) is usually characterized by significant proteinuria and generalized edema. Currently known loci for FSGS are located on chromosomes 1q25, 11q22, and 19q13 (2,4,6-9⇓⇓⇓⇓⇓). In contrast to FSGS, AS is associated with hematuria, deafness, and characteristic ultrastructural abnormalities of the glomerular basement membrane (GBM) (5,10⇓). AS also displays considerable phenotypic and genetic heterogeneity with the classic X-linked forms accounting for almost 85% of the cases, and the remaining 15% of cases showing autosomal inheritance (11–14⇓⇓⇓). X-linked AS (MIM 301050) is associated with type IV collagen alpha 5 chain (COL4A5) mutations, while mutations in alpha 3 chain (COL4A3) and alpha 4 chain (COL4A4) genes, located on chromosome 2q35-q37, have been found in cases of both autosomal recessive (MIM 203780) and dominant (MIM 104200) AS (12–16⇓⇓⇓⇓). Also, mutations in myosin heavy chain-9 nonmuscle gene (MYH9) cause Epstein and Fechtner syndromes, which can be associated with an autosomal dominant nephropathy that has some features of AS (17,18⇓). Thus the autosomal dominant nephropathy phenotype shows significant genetic heterogeneity. In this study, we describe an Asian Indian family with autosomal dominant progressive nephropathy, with features of both FSGS and AS, where genetic linkage was excluded for various currently known candidate genes and a new locus was found on chromosome 11. Evaluation of CHP Family #177 members (pedigree shown in Figure 1) included a complete history, renal, hematologic and liver function tests, urinalysis, audiometric and ophthalmologic evaluations, radiologic and renal histologic studies. Asymptomatic individuals were examined for proteinuria and hematuria with qualitative urinalysis, and selected individuals were also studied with audiometry. Family members were classified as affected if they had ESRD requiring dialysis or renal transplantation or had elevated blood urea nitrogen (BUN) and serum creatinine (SCr) or had hematuria (>10 RBC/hpf) and/or > 2+ proteinuria by qualitative urinalysis, with or without hearing loss, in the absence of other systemic diseases that are likely to lead to proteinuria or hematuria. They were classified as unaffected if they were over 12 yr of age and had no hearing loss or detectable hematuria or proteinuria on qualitative urinalysis and were normotensive or were unrelated married-in spouses. They were categorized as unknown if: (a) they had hearing loss on audiometry but had no urinary or renal function anomalies, or (b) no clinical information was available, or (c) were less than 12 yr of age and had no hearing, urinary or renal function anomalies. Individual GPID III:20 was classified as unknown because she showed persistent low-grade proteinuria at a young age but no other symptoms. Figure 1. Pedigree of CHP Family #177. The open symbols stand for unaffected males (□) and unaffected females (○). The filled symbols represent affected males (▪) and affected females (•). The θ symbol represents deceased family members with unknown affection status. The numbers below each symbol refer to generation and person ID (GPID), which is also shown in Table 1. Half-filled symbols indicate unknown affection status. The stars indicate the persons whose DNA was used for genome-wide scan. Alleles within parenthesis were inferred. High–molecular weight genomic DNA was isolated from EDTA whole blood by a salting-out procedure as previously reported (19,20⇓). These studies were performed after obtaining informed consent and were approved by the human rights committee of the Children’s Hospital of Pittsburgh and Railway Hospital, New Delhi. Figure 1 identifies the pedigree members whose genomic DNA was used for these studies. Fluorescence genotyping was carried out by NHLBI mammalian genotyping service facilities at Marshfield Clinics using approximately 400 microsatellite markers of screening set 10, which provided an average spacing of 9 cM across the genome (http://www.marshfieldclinic.org/research/genetics/sets/Set10ScreenFrames.htm). The PCR for fine mapping was performed on Techne thermocycler (Techne Inc, Princeton, NJ), and PCR products were resolved on ABI-3700 capillary analyzer (Applied Biosystems, Foster City, CA) located in Center for Human Genetics and Integrative Biology of the University of Pittsburgh (19). The data were analyzed by GENOTYPER program (version 3.7, Applera Corp, Norwalk, CT) and entered in PROGENY2000 database management system (Progeny Software, South Bend, IN). The following fluorescent dye–labeled markers were obtained from Research Genetics/Invitrogen (Carlsbad, CA) and used for fine mapping of the chromosome 11q24 region: D11S2371, D11S2002, D11S2000, D1S1986, D11S908, D11S1998, D11S4460, D11S95, D11S4464, D11S1328, D11S934, D11S1304, D11S969. A visual inspection of the pedigree suggested autosomal dominant inheritance. The maximum attainable LOD (the log of the odds of linkage) score for the pedigree was obtained by computer simulation studies with the SLINK program (21). For these simulations, the disease was assumed to be autosomal dominant with an allele frequency of 0.0001. Assuming a four-allele system with equal frequencies, simulations used a 5% recombination with the disease locus and various penetrance values ranging from 0.7 to 0.99. A set of 1000 iterations was generated, and maximum attainable LOD score was calculated using MSIM for various theta. The genotyping data were assessed by PEDCHECK program to identify and correct Mendelian errors (22). The linkage was calculated under a dominant model with penetrance ranging from 0.8 to 0.99, no phenocopies, and assuming a disease allele frequency of 0.0001, using the GENEHUNTER (Cambridge, UK) and VITESSE statistical programs for each marker in the genome-wide scan (23,24⇓). Marker allele frequencies were calculated from the unrelated spouses in the family. Map distances for the marker loci were obtained from published data of Marshfield Clinics. Haplotype analysis was performed by using SIMWALK software and also via visual inspection (25). Two-point and multipoint LOD scores (z scores) and z-1 confidence intervals were calculated on fine mapping data using VITESSE algorithm as described previously (24,26⇓). A LOD score > 3.0 is considered significant evidence for linkage, and < −2.0 is significant evidence for exclusion of linkage. A candidate interval was considered excluded when two affected individuals within the pedigree inherited different haplotypes. CHP Family #177 is a 39-member kindred, with seven affecteds, residing in a well-demarcated geographical area 200 miles north of New Delhi, India. The clinical features of the various family members are summarized in Table 1. A total of 18 DNA samples were analyzed for the genome-wide scan as shown in Figure 1, and 21 DNA samples were analyzed for fine mapping. None of the family members showed any signs of leiomyomatosis, ocular abnormality, altered liver function, macrothrombocytopenia, or polymorphonuclear inclusion bodies. Salient features of some of individuals identified by their generation and pedigree ID (GPID) are presented in brief below. A 38-yr-old male presented with intermittent painless hematuria for 8 yr and hypertension (BP range, 180 to 120/70 to 104 mmHg) for 2 yr. Urinalysis revealed 4+ proteinuria and RBC > 30 to 40/hpf. Investigations showed the following: hemoglobin (Hgb), 11 g/dl; white blood cell count (WBC), 9800/mm3; BUN, 22 mg/dl; SCr, 1.0 mg/dl. Audiometry showed high tone deafness. A 35-yr-old male presented with painless hematuria of 12 yr duration. He had developed anasarca 4 yr ago and was found to have hypertension (BP range, 160 to 120/76 to 100 mmHg) requiring two anti-hypertensive drugs (amlodepin 5 mg/d; losartan 25 mg orally twice daily). Investigations showed the following: BUN, 63 mg/dl; SCr, 2 mg/dl; phosphorus (P), 6.8 mg/dl; serum albumin (Alb), 3.8 g/dl. A urinalysis showed 3+ to 4+ protein and 30 to 40 RBC/hpf. Eye examination did not reveal lenticonus. Audiometry showed a moderate hearing impairment with a 30 to 40-dB hearing loss at 250 Hz (low tone) and 40 to 50-dB loss at the frequency of 8000 Hz (high tone). He had normal or near-normal hearing at frequencies ranging from 500 to 4000 Hz (Figure 2). The renal disease progressed to ESRD with in 1 yr. He underwent a living related renal transplantation, with a sister being the donor, in the year 2000. His current immunosuppression comprises cyclosporine, azathioprine, and prednisolone, and current SCr ranges from 1.0 to 1.2 mg/dl. His son (GPID III:9) also shows early stages of renal involvement manifesting as hematuria and has sensorineural deafness. The donor (GPID II:7) was also found to have combined low tone (30 to 40 dB) and high tone (40 to 50 dB) sensorineural hearing loss on audiometry during evaluations for this study but showed no urinary and renal function anomalies. Figure 2. Audiogram of GPID II:11 showing unmasked air and bone conduction curves for right and left ears. A mild hearing loss for low frequencies (<1000 Hz) and mild to moderate hearing loss for high frequencies (>4000 Hz) is seen in both ears. A 33-yr-old male presented with painless hematuria and proteinuria of 8 yr duration with hypertension (BP range, 180 to 110/80 to 100 mmHg) for 2 yr, requiring two anti-hypertensive drugs (5 mg/d amlodepin; 5 mg enalapril orally twice daily). Investigations at presentation revealed the following: urine protein, 2+; RBC, 25 to 30/hpf; Hgb, 12.8 g/dl; WBC, 9600/mm3; BUN, 33 mg/dl; SCr, 2.6 mg/dl; Ca, 8.6 mg/dl; P, 4.3 mg/dl; uric acid, 9.4 mg/dl; total protein, 5.9 g/dl; Alb, 3.5 g/dl; total bilirubin, 0.4 mg/dl; SGOT, 15 IU/L; SGPT, 12 IU/L. The serologic investigations showed negative anti-nuclear antibodies and a normal C3. Audiometry showed high tone sensorineural hearing deficit. A 30-yr-old male presented with intermittent hematuria for 15 yr and hypertension (BP range, 150 to 200/76 to 110 mmHg). He progressed to ESRD over a period of 6 yr. In March 1997, his Hgb was 5.6 g/dl; WBC, 7000/mm3; BUN, 90 mg/dl; SCr, 5.7 mg/dl. Urinalysis revealed 6 to 8 RBC/hpf and 2+ protein. He received living related renal allograft from his sister (GPID II:3) in August 1998. He currently has stable renal function on azathioprine and prednisolone (SCr, 1.5 to 1.7 mg/dl). The kidney biopsy was performed in two members, i.e., GPID II:9 and II:13, and the findings are shown in Figure 3. 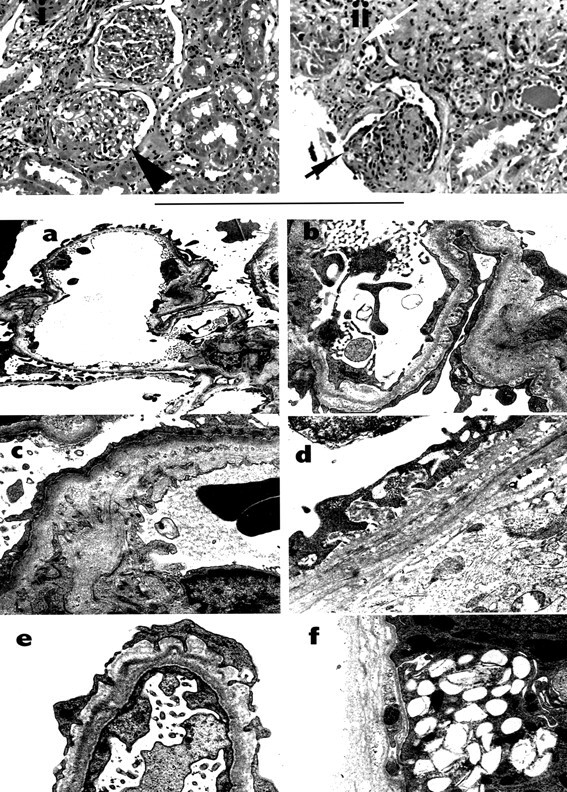 The renal histology was relatively well preserved in GPID II:9 and showed focal segmental glomerular sclerosis and hyalinosis on light microscopy (Figure 3i, upper panel). The glomerular capillaries appeared to be of normal thickness, and the mesangial cellularity was not increased. The kidney biopsy in GPID II:13 had inadequate tissue but showed a more advanced disease with focal global glomerular sclerosis where a number of glomeruli were completely sclerosed (Figure 2ii, upper panel). Blood vessels were unremarkable, but the tubulointerstitial region showed focal tubular atrophy with interstitial fibrosis. The immunofluorescence was negative for all immunoglobulins and C3 in both GPID II:9 and II:13. Electron microscopic studies on the patient GPID II:9 are shown in the lower panel of Figure 3 (a-f). The most striking features were those of variable thickness of the GBM along with areas of rarified membranes. Inflammatory features were absent. GBM thickness, when measured on the thinnest-looking segments, ranged from 173.6 to 177 nm (versus normal adult controls thickness of 350 ± 43 nm ). Focal zones of lamellar membrane duplication and irregular thickening were also seen interspersed with the thin zones. The tubular basement membranes also showed the same irregular thickening and lamellation as seen in the GBM. Figure 3. Kidney biopsy findings in CHP family # 177. Upper panel: (i) light microscopic changes in patient II:9 showing a relatively well-preserved cortex with a glomerulus showing segmental sclerosis (arrow); (ii) kidney biopsy in patient II:13 showing a more advanced disease with a partially sclerotic (black arrow) and a completely sclerosed glomerulus (white arrow). Lower Panel: electron microscopic studies of patient II:9. (a) Low-power view showing open capillary loops with normal mesangial and epithelial cellularity; note the thin segments (×8000). (b) Higher-power view showing thicker areas of the GBM (×26000). (c and d) Areas of GBM showing membrane duplication and irregular thickening (c, ×19500) and lamellation (d, ×26000). (e) Epithelial cell foot process fusion was focal and mild (×34,000). (f) The tubular basement membrane showing lamellation (×26000). Simulation studies using SLINK showed that the CHP family #177 was capable of generating peak LOD scores of 2.4 to 2.8 under an autosomal dominant model, with penetrance ranging from 70 to 99%. We first analyzed the genome-wide genotyping data for linkage to the known candidate genes. This analysis revealed negative LOD scores for chromosome 2q35-q37 region containing COL4A3 and COL4A4, with marker D2S1363 showing a LOD score of −6.11 and D2S427 showing a LOD score of −2.14 on two-point VITESSE analysis. Analysis for the markers located at other candidate regions, i.e., for COL4A1 and COL4A2 on chromosome 13q33-q34 and MYH9 on chromosome 22q11.2, also revealed consistently negative LOD scores at θ = 0 (Table 2). The genomic position for the various genes and markers is based on the June 2002 assembly of the human genome available through University of California Santa Cruz (UCSC) genome browser (http://genome.ucsc.edu). We also analyzed LOD scores for markers near LMX1B, the gene responsible for nail-patella syndrome. Although the LOD scores were not less than −2.0, linkage to this region was considered unlikely given the negative and low positive LOD scores. We further excluded linkage to chromosome 1q25 and 19q13 regions, as LOD scores were generally less than −2.0 under various penetrance models. The X-linked inheritance was ruled out in view of male-to-male transmission: i.e., GPID III:19 inherited the disease from GPID II:11, while GPID III:4 inherited from obligate carrier GPID II:1 (Figure 1). Also, GPID III:10, although considered unknown for this study, was found to have low-tone sensorineural deafness and shares the affected haplotype with his father GPID II:5. Analysis of genome-wide data by GENEHUNTER under a dominant inheritance model with 80% penetrance identified several chromosomal regions with a LOD score > 1, i.e., chromosomes 11, 3, 13, 12, and 15. The chromosome 11–linked region was further investigated by fine mapping using 13 markers spaced approximately 1 to 3 cM apart. The entire FSGS2 interval, spanned by D11S2002 to D11S1986, as reported by Winn et al. (6), had LOD scores less than −2.0. A peak two-point LOD score of 2.02 was obtained on VITESSE analysis, with 99% penetrance and at θ = 0 for marker D11S4464 (Table 2). A multipoint LOD score (Z score) of 3.2 was obtained for this trait locus, which we denote as FSGSAS, in the same region between markers D11S925 and D11S4464. Figure 4 shows the multipoint LOD score and NPL score plots. By using the maximum LOD-1 (Z-1) method, we constructed a support interval with an asymptotic confidence interval > 95% (26). The FSGSAS support interval was flanked by maker D11S4460 proximally and D11S1328 distally. The haplotypes for eight of the markers, in the order cen-D11S908, D11S1998, D11S4460, D11S925, D11S4464, D11S1328, D11S934, D11S1304-tel, are shown below each individual genotyped in Figure 1. Recombinant events in individuals II:11 and II:13 also localize the linked region to an approximately 7-cM interval bound by markers D11S4460 and D11S1328. Figure 4. (A) Multipoint LOD (z score) plot for chromosome 11q23–24 region based on VITESSE analyses, and (B) NPL score plot for the same region as generated by GENEHUNTER analyses. It has become evident that autosomal dominant nephropathy phenotype includes many disorders, such as FSGS and AS (2,4,6,7,15,16⇓⇓⇓⇓⇓). Although considerable advances have been made in our understanding of the molecular genetics and pathogenesis of these syndromes over the last decade, new genes and genetic loci continue to be identified for phenotypes that were once considered to be monogenic or oligogenic (2,4,9,16⇓⇓⇓). In this report, we present a family with autosomal dominant progressive nephropathy with features of FSGS and AS including renal failure and deafness. The affected members presented with hypertension, microscopic hematuria, and features of nephrotic syndrome. Progressive renal failure leading to renal transplantation occurred in two members in the 3rd to 4th decade of life. One of the affected individuals presented with anasarca, while another presented with a less progressive renal disease manifesting with nephrotic range proteinuria, but without the full-blown nephrotic syndrome. Affected members also had sensorineural deafness but no eye or hematologic abnormalities. This family did not show linkage to currently identified loci associated with either the AS phenotype (i.e., COL4 genes) or Epstein/Fechtner syndrome (MYH9). Linkage of this trait was also excluded for the chromosomal regions that are linked with FSGS phenotype, i.e., the FSGS2 region on 11q21 reported by Winn et al. ; chromosome 1q25 (podocin [NPHS2] gene); and 19q13 (nephrin [NPHS1] and alpha actinin-4 [ACTN4] genes) (6–9⇓⇓⇓). Our findings suggest that this is a new syndrome associated with ESRD and linked to a new region on chromosome 11q24. We chose a rather conservative approach for the affected status classification scheme to minimize the possibility of misclassification. Indeed, many of the individuals classified as unknown had haplotypes that segregated with the disease allele and had abnormalities detected on audiometry or urinalyses. If these individuals were to be considered as affecteds, the LOD scores increase significantly. Also, the disease appeared to be more severe in males, and male-to-male transmission was seen. Another interesting point is that of unaffected obligate heterozygote (GPID II:1), suggesting incomplete penetrance. This highlights the difficulty in assigning accurate penetrance parameters for this disorder. It thus appears that individuals with this trait can have the disease gene and be completely asymptomatic even if they are much older than the average age of onset. The current family showed considerable phenotypic heterogeneity with respect to age of onset, association of renal and hearing anomalies, and penetrance. These features are also seen in AS, where renal disease generally manifests as recurrent microscopic or gross hematuria associated with high frequency sensorineural hearing loss and/or ocular anomalies and progression to renal failure usually occurs, at least in males, by the fifth decade (5). The classic AS phenotype, however, shows considerable phenotypic heterogeneity in the age of onset of ESRD, and the severity of auditory and renal features may not correlate (11,28⇓). The renal histology in AS can also be variable and involves both glomerular and tubulointerstitial abnormalities. The ultrastructural changes of irregularly thickened and attenuated GBM, as well as the “basket weave” alteration in the lamina densa, have been considered to be a pathognomonic histologic feature of AS (28). A kidney biopsy was performed in two individuals in our report and showed glomeruli with features of FSGS on light microscopy and negative immunofluorescence along with significant tubulointerstitial disease. The electron microscopy showed varying GBM thickness including some very thin areas. A “basket weave” pattern was also seen in the tubular basement membrane, although this feature is not specific to AS. These histologic findings thus comprise features of both FSGS and AS. The classic phenotype of AS generally segregates as an X-linked dominant disorder and is associated with mutations in the COL4A5 gene (12). In addition to the X-linked forms, both autosomal recessive and dominant forms have been described. Recent identification of mutations in COL4A3 and COL4A4 genes, which are located in tandem on 2q35-q37 (13–16⇓⇓⇓) in both autosomal recessive and dominant forms suggest that AS phenotype is a disorder that is mostly associated with COL4 genes (28,29⇓). In the present report, we excluded linkage to all of these collagen genes as well as to COL4A1 and COL4A2 region on chromosome 13, which is not yet associated with any human disease. A unique characteristic of this syndrome may be that the affecteds have features of both low-tone and high-tone deafness. A review of literature revealed a possibly similar familial nephropathy reported by Motoyama et al. in Japan (30). The proband in that family was a 14-yr-old girl with hematuria and proteinuria that was also seen in several affecteds on the maternal side of the pedigree. She developed nephrotic syndrome with mild renal dysfunction (creatinine clearance, 57.9 ml/min per 1.48 m2) and a renal biopsy showed segmental mesangial hypercellularity, numerous interstitial foam cells, and thinning and splitting of the GBM. Audiologic studies detected bilateral low-tone (from 125 Hz to 1000 Hz) sensorineural hearing difficulty, ranging from 30 to 40 dB. Audiogram of her brother also revealed low-tone sensorineural hearing loss. Their mother had nephrotic syndrome during pregnancy, and her renal biopsy had shown mild mesangial proliferation with irregularity of GBM. Further identification of such cases and similar pedigrees may define this syndrome further. Besides classic AS, it has lately become evident that some cases manifesting with dominant hereditary nephropathy and deafness may have hematologic abnormalities and would then actually be considered to have Epstein syndrome (MIM 153650), or Fechtner syndrome (MIM 153640) (28). Some families with Fechtner syndrome have also been reported with cataracts or altered liver function (31). These megakaryocytic syndromes are now considered allelic and are associated with mutations in the gene encoding nonmuscle myosin heavy chain IIA (MYH9), located on chromosome region 22q11-q13 (18). The family that we report had no identifiable platelet or neutrophil anomalies, and the affecteds had normal liver function. We excluded linkage to chromosome region 22q11-q13 region in this family. We also studied linkage to chromosome 9 markers for another autosomal dominant nephropathy, i.e., nail-patella syndrome, which is associated with mutations in LMX1B, although the reported family did not have many of the features of this syndrome (3). Our results showed that such linkage was unlikely and the locus identified by us most likely represents association with a new syndrome. In addition to the AS phenotype, some of the affecteds in this report had features of nephrotic syndrome, which is commonly seen with FSGS but is infrequently noted in AS (32). The pathogenesis of FSGS is only partially understood, although genetic factors have been increasingly thought to play a major role (2,4⇓). Recent studies have implicated mutations in ACTN4 (on chromosome 19q13) and linkage to chromosome 11q21–22 region (FSGS2 locus) in the pathogenesis of dominantly inherited FSGS (6,7⇓). The gene for FSGS2 is currently unknown. However, most of the autosomal dominant FSGS cases do not map to 19q13 or 11q21–22 or have not been found to have mutations in ACTN4 (4,6⇓). These observations suggest that FSGS may be a final common pathway of several forms of glomerular injury and possibly several other genes remain to be discovered. Our findings localized the FSGSAS trait in CHP 177 family to approximately 7-cM region on chromosome 11q24, and linkage was excluded for the entire FSGS2 interval spanned by D11S2002–D11S1986 reported by Winn et al. (6). The histologic heterogeneity seen in our reported family is consistent with monogenic renal disease and has also been reported before by several groups, including our group and also by Winn et al. and Mathis et al. (6,7,24⇓⇓). The linked area on chromosome 11q24 in this family is approximately 20 cM telomeric to FSGS2 locus and has several interesting candidate genes. One such gene, tectorin alpha (TECTA), shares homology with utrophin and is mutated in a dominant form of inherited deafness (33). Utrophin is a paralogue of dystrophin and has two full-length mRNA species, A and B, which have very different expression patterns. B-utrophin is expressed in vascular endothelial cells, whereas A-utrophin is expressed at the neuromuscular junction, choroid plexus, pia mater, and renal glomerulus (34). TECTA is not expressed in the kidneys, but computer modeling predicts presence of several tectorin-like genes in this region that would need to be studied further. Another strong candidate gene in this region could be CDON, named after a surface glycoprotein that transcribes a cell adhesion molecule-related protein, which is downregulated by oncogenes (35). It is a member of the Ig superfamily and may have functional similarity to nephrin, which is mutated in the autosomal recessive congenital nephrotic syndrome of Finnish type (9). Studies are currently in progress to narrow the region further and to analyze the sequence of these two genes in the affecteds. In summary, our findings suggest further locus heterogeneity for autosomal dominant nephropathy phenotype. Most of the autosomal dominant nephropathies with features of nephrotic syndrome do not, as yet, have an identifiable genetic cause; it is therefore hoped that our findings would contribute to search for additional loci for this phenotype. Identification of new families with linkage to 11q24 locus will aid in localization of causative gene and would help in our understanding of the pathophysiology of disorders associated with ESRD. This study was supported by a Young Investigator award from the National Kidney Foundation and NIH (K23-DK02854) to Abhay Vats. We thank the NHLBI mammalian genotyping service at Marshfield Clinics for performing the genome-wide scans on this family as a part of a larger project. We also would like to thank audiologist Clyde G. Smith, MS, for help with the interpretation of the audiometry data and Janet Walpusk for assistance with electron microscopy. We are grateful to the reported family members for their participation. The paper was partially presented in abstract form at the Annual Society of Nephrology meeting held in Philadelphia PA, in November 2002. Dr Abhay Vats is a consultant for ViraCor Biotechnologies.